... It's that time of year again. 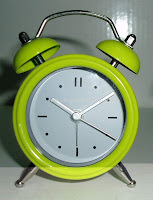 The clocks go forward an hour tonight, so British Summertime will start. True to form, the weather is vile: cold, wet and windy. More confirmation that Summer is here! The cake stall is more my thing... 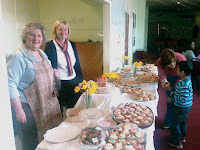 I had a little more penance to do, though, as someone else snaffled my favourite cherry and almond cake from just under my nose (I'd been taking the photo of it, between the bunches of daffodils!) I duly offered it up... but don't feel too sorry for me: I happily settled for the apple sponge cake and the bread-and-butter pudding instead, as well as a few fairy cakes to accompany the cup of tea! 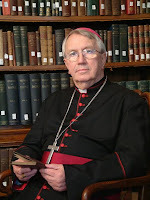 Bishop O'Donoghue continues to be the lone voice from the Bishops' Conference prepared to speak out on matters of importance. Heirs to the throne being allowed to marry Catholics is not a life-and-death issue. "It has been widely reported in the media that the Advertising Standards Authority is considering allowing the abortion industry to advertise through the broadcasting media. This deeply damaging proposal originates from the Independent Advisory Group on Sexual Health & HIV and therefore comes from the heart of the abortion industry – threatening yet another hammer-blow to the sanctity of human life in this country. "I am appalled that this proposal will result in the deaths of many more preborn children and cause untold harm to women. As a society, we need to wake up and stop treating abortion as a quick-fix solution to pregnancy and offer compassionate and practical support to women facing crisis pregnancies. The Cardinal Winning Pro-Life Initiative in Scotland is a shining example of the Church and others reaching out to pregnant women who find themselves isolated and frightened, offering emotional support and practical help such as liaising with families and providing financial assistance to women in need. "The killing of the innocent can never be a genuine solution to a problem. I urge all those who care about the sanctity of human life to voice their opposition to this proposal with one voice. At the same time, please consider lending your support to our pro-life organizations that care about mothers and their preborn children." The Cardinal Winning Pro-Life Initiative is the same one run by the Sisters of the Gospel of Life. Jane Teresa's post gives details of how to respond to the consultation process, so there is some concrete action which can be taken. It's getting close to the end of term, and I'm shattered. 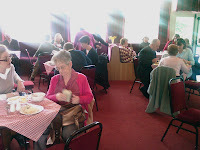 I knew that, if I went home after school this evening, I wouldn't have the energy to go out for Rosary and Benediction, so I drove to the chip shop nearest the church, bought a portion of chips, doused them in plenty of salt and vinegar, and ate them while parked in the church car-park. I was then able to spend some time in the church catching up on praying the Office before the Rosary started. The only disadvantage is that my car now smells strongly of vinegar. 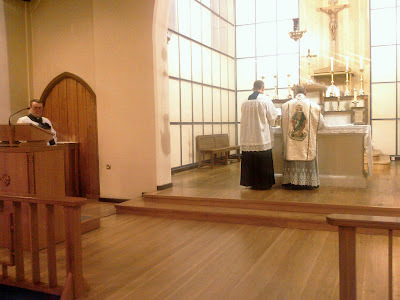 The Tantum ergo follows, and then the actual Benediction. We pray the Divine Praises in reparation for blasphemies, and the Blessed Sacrament is reposed in the tabernacle while we sing another hymn... (on Saturdays we have Adoremus in aeternum, but Thursday's hymn varies.) Finally, we move over to the Lady Altar, recite a few prayers to Our Lady (such as the Memorare) and then end with four verses of Immaculate Mary. I've posted before about the ghastly hymn book we have - it has changed many of the words of popular hymns and carols in order to be more inclusive. If I know the original words, I will sing them... loudly... and I have quite a powerful voice. I am also aided and abetted in this enterprise by Fr. Tim. O Saviour of us all. Grrrrrr. Time to burn those hymn books and print our own, I think! 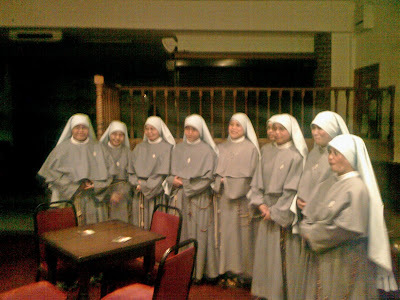 ...but, of course, it's the Feast of the Annunciation, and I knew that the Sisters of the Immaculate were coming to Blackfen to sing the propers of the Mass, so I dragged my weary bones to the church. Fr. Charles Briggs (PP of St. Mary's, Chislehurst) was paying us a visit... and he caught me taking a few photos! The only thing left to say: "Tabula delenda est!" Just like Leutgeb, I have received an acknowledgement of my complaint about the offensive cartoon of the Holy Father, along with a promise "to look into it." ...but watch this space anyway! Please accept our heartfelt love and admiration for your prophetic and courageous proclamation of the Gospel of Jesus Christ in season and out of season. We are in deep solidarity with you against the terrible distortions and attacks by condom-promoters in the press and, even more shamefully, in governments. The Vicar of Christ will always be a sign of contradiction to those blinded by ideology. Your words of compassion and common sense are to be praised highly. Thank you for your witness of hope and love to a world that is increasingly hostile to the truth, especially if it calls into question the foundations of the "Sexual Revolution." You can add your signature to the letter by following this link. The form asks for your postal address, but it works without that information. 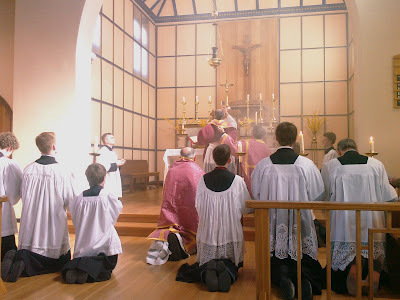 Twitch of the mantilla to Fr. Anthony Ho. This is so appalling that I was actually lost for words... I had to discard at least two attempts at writing this post. I'm not really surprised, though. The animal rights lobby has always been more vocal than the pro-life one, and has demonstrated scant regard for any human life in the past, so a lack of regard for human embryos is a logical step. I understand the need to reduce the use of animals in medical research. I even applaud the idea that alternatives must be explored before using animals (it's actually already part of UK Law - in the Animals (Scientific Procedures) Act 1986.) But I object to the idea that human embryonic tissue can be included as an acceptable alternative to animal experimentation. The Chrism Mass "Thank You" cards have just arrived from the printers. I think that this year's card compares favourably with those of previous years... though it's difficult to see from the JPEG files. Trust me, they look really snazzy "in the flesh," so to speak! 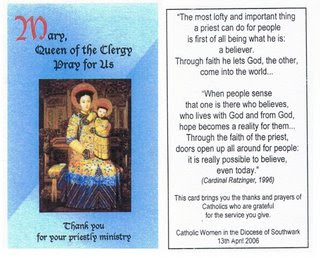 When we started in 2003, I wanted to make the cards something the priests could use as a marker in their breviaries, perhaps as a keepsake. I bought a medium-weight one-sided photo paper, and printed the text on the back with a mono laser printer, and then printed the front on my colour ink-jet printer... the downside was the length of time needed to print the sheets (the printer wasn't very good, and I needed to feed the paper in by hand because of the thickness, to ensure the front aligned with the back) and the time taken to cut the cards up carefully using a small guillotine. In 2006, my ink jet printer had a conniption just as I was starting to get the cards done. Major emergency! Fortunately I was able to find a local printer, and they colour-photocopied the sheets of cards... the result wasn't quite as good, though, as the photocopied cards lacked the slight glossy sheen of the ink-jet prints. 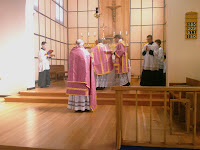 A happy Laetare Sunday to you all! 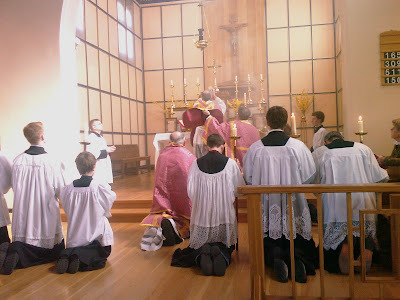 Rather later than anticipated, (I had a few errands to run) but better late than never, I have some photos from this morning's Mass at Blackfen. Fr. Tim gave me his snazzy camera, with instructions to get some good "long shots" from the back of the church. I'm unable to kneel, and I'm not exactly light on my feet, nor am I in any way inconspicuous, so I delegated the task of Official Photographer to Carl. I stayed put in my usual pew, and snapped away quietly from the front... the best vantage point of all, according to Carl, who confessed to contemplating whether it was worth him trying to oust me from the front for a few of the photos. He obviously decided that it was more than his life was worth, and contented himself with judicious use of the zoom lens. Fr. Tim hasn't uploaded his photos yet, so I'm getting in there first with my dinky phone camera. Dr. Laurence Hemming made a special trip to Blackfen, and John Harrison, permanent deacon at St. Mary's Chislehurst, allowed himself to be snaffled by Fr. 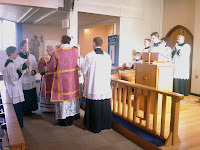 Tim (with the consent of his PP) so that we were able to have a full Solemn High Mass, and the new rose vestments were displayed in all their glory. 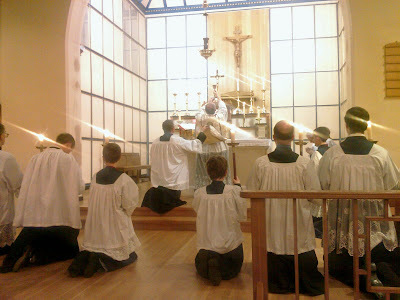 We also had a good number of servers, which meant that we were able to field six torch bearers for the Canon of the Mass. 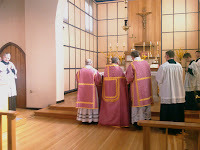 Mass is, naturally, always an awesome event, simply by virtue of the fact that God becomes present... but the ceremonies of a Solemn High Mass just add that something extra special. Jonathan, our MC, remarked afterwards that it was the largest humeral veil he had ever seen... our sub-deacon was nearly lost beneath it. I really love the fact that the clouds of incense seem to fill the sanctuary during the Consecration. My little phone camera can't always quite catch it... but this time I was lucky. Keep an eye out for the "proper," high resolution photos which will be making an appearance over at Fr. Tim's blog. 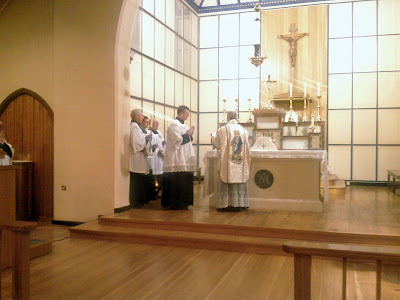 UPDATE: As expected, His Hermeneuticalness has indeed put up a post about the Mass with some stunning photos... you can see them HERE.